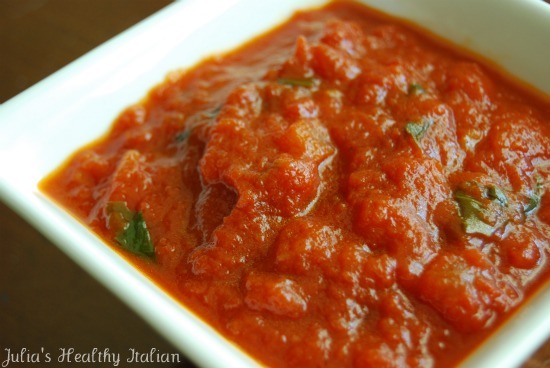 This Perfect Every Time Tomato Sauce is thick, smooth and well, perfect. I used Pomi tomatoes this time, but also use San Marzano tomato cans, both from Italian tomatoes, which makes a difference. I do prefer the San Marzano though. I make more sauce than I need, so I can store it in the fridge or freeze it for future use. This recipe is enough for 2 meals. Italian food is about a few simple ingredients. The reason it tastes so good is it's quality. In order for these recipes to turn out great, you should use highest quality ingredients you can find. Not high price, but high quality. You know you're Italian when most of your house plants are edible. I cannot cook without fresh basil. Basil is expensive and sometimes hard to come by in certain areas, especially in winter. That's why I have a basil plant in my window all year long. The fresh basil in this sauce gives it the finishing touch, so be sure to use fresh if possible. Sauté garlic and onion in oil for 10 minutes on medium low heat until onion and garlic are a bit translucent and just beginning to brown. Add tomato, water, 2 tsp sugar, salt and pepper. Cook with the lid slightly agape on low heat, stirring every 5 minutes or so for 30 minutes. Turn off flame and add basil. Okay, last and most important part. TASTE IT. Take a spoon full out and rest the spoon on a plate for a couple minutes before you taste it. When its too hot its hard to pick up the nuances of the flavors. Once its a bit cooled, taste it. If it has a little bit of an acidic taste then add the 3rd teaspoon of sugar. If it doesn't, leave it alone, it's perfect! You'll understand how good it is when you put it over pasta or in any of my recipes that calls for tomato sauce. If you feel the sauce sticking to the bottom of the pot, reduce the heat a bit and stir more frequently. Since tomatoes vary by origin, season and many other factors, it is important to use your own taste buds. No one knows better than you what you like, so give the sauce a taste and adjust according to your preferences. Perhaps you like a bit of spice, then add more pepper or some red pepper flakes. Maybe you prefer a bit more runny of a sauce, add a bit of water. You get the point. Cooking the onion slowly on a medium low flame allows it to caramelize a bit. That caramelization will ensure a measure of sweetness to the sauce you cannot achieve otherwise. Be sure to keep the flame low enough to allow them to cook slowly without burning. Serves 6 over pasta plus enough to freeze for another time. Pasta is cherished at my house and I tried your sauce recipe tonight (saw it in my blogroll today) and it is, hands down, the best sauce I've ever made. I added ground turkey and a bit of Italian sausage. We'll be repeating this dish regularly. Thank you. Thank you Agatha, so glad you loved it. I like your turkey and sausage addition. Sounds yummy. I only put the Perfect Every Time label on stuff that works consistenly, like this sauce!! Hope to see more posts from you...how could anyone forget your name!! This was fabulous and so very easy. I used it over a skinnytaste recipe (chicken parm) and it was perfect. I can't wait to do some further experimenting like adding meats & veggies. Well done! 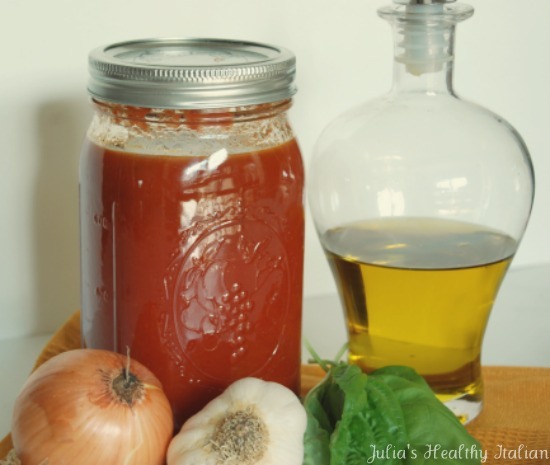 Julia, as with all your recipes tried so far....this sauce was a hit in my house. Thanks for all the great ideas. Thank you Connie. It's always great to hear when things work out well! Sauce turned out fantastic! I used pomi chopped tomatoes too. They were the only "chopped" tomatoes I could find. Would diced or crushed be a good substitute for chopped? thanks for your great recipes! Made it again last night with some added chopped sirloin and crushed tomatoes instead of chopped. Truly perfect every time!! I made this sauce last week with the baked turkey meatballs it was so good! Its a simple, good for everything sauce. I used it over pasta & then used it for chicken parmesan later in the week!! Very easy to make & versatile! Just made this sauce tonight and it was great! Served it with homemade arancini leftover from last night's risotto. I made this sauce last night. I prefer San Marzano tomatoes, but my store only carries them whole, so I put them in the blender, and used 2 28oz cans of that, rather than 1 can of crushed, and one can of puree. My sauce came out very thin and watery. Any idea how I can thicken it up a bit? You need to sync with pinterest! I need to pin this to my food board!